A St Croix river vacation at the Woodland Trails Bed and Breakfast. A newly-built bed and breakfast and cabin located on 500 acres of woodland on the St. Croix River near Hinckley, Minnesota, less than 2 hours from the Twin Cities. Built in 2003, the rustic decor, generous common areas and modern construction set Woodland Trails apart from restored Victorian facilities. 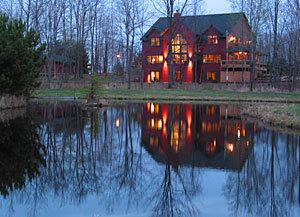 Woodland Trails Bed & Breakfast offers spacious guest rooms, with fireplace, private bath and whirlpool tub. A Guest Cabin is also available. With 3 bedrooms and 2 baths, it is perfect for families and small groups.